A dwarf sedum with attractive variegated foliage. Its white buds open to reveal a blush of pink. 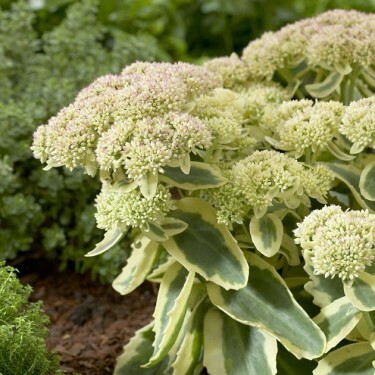 Sedums are tough, drought tolerant, easy-to-grow perennials that feature star-shaped flowers in clusters blooming on fleshy-leaved plants ranging from mat-forming ground covers to clump-forming upright mounds. Their flowers are attractive to butterflies and spent flower clusters typically retain their shape and add some winter interest to garden areas.